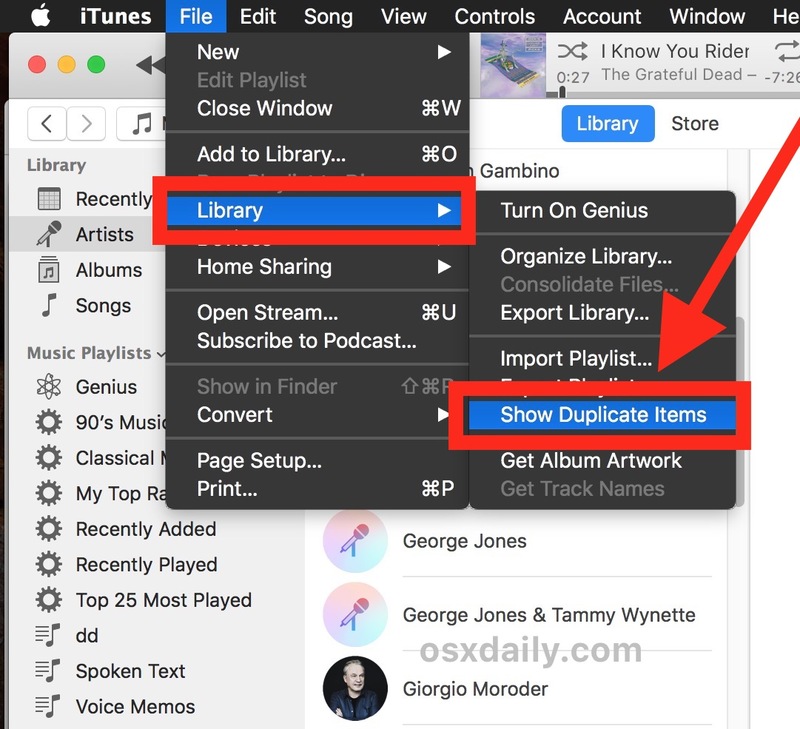 iTunes offers a simple way to track down and find duplicate songs in a music library, so if you find yourself hearing the same song every once in a while when listening to iTunes on a Mac or Windows, or after copying music to an iPhone, iPad, or iPod, then it’s quite possible duplicate tracks are to blame. It’s fairly easy for music libraries to contain duplicate songs and tracks, particularly as you build a collection over time. If you’re ripping CDs and importing music into iTunes, downloading songs from SoundCloud and the web, buying albums and songs from multiple sources like iTunes, Amazon, and elsewhere, it’s fairly easy to eventually end up with duplicate versions of the same song. While iTunes has long has the capability of finding duplicate songs, the feature has been moved in modern versions of iTunes from version 12.0 and later, which has led many users to believe that you can’t find duplicate tracks with the app anymore. But that’s not the case, it has just been relocated. Are iTunes Songs Actually Duplicates, or Just Sharing a Track Name? 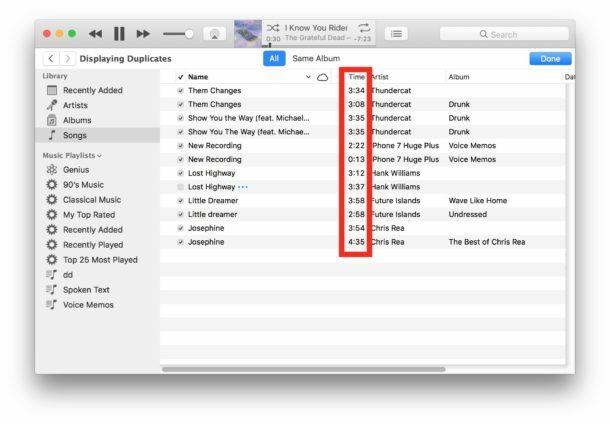 Once you’re at the “Displaying Duplicates” screen in iTunes, it will be entirely up to you to confirm if songs and tracks are actually duplicates, or if they simply share the same song title name or artist name. This does not necessarily mean the songs are the same, however. For example, iTunes will show as “duplicates” two different versions of the same song if they share the same track name, even if the songs and files are actually totally different. This is important to understand, particularly if you have a lot of music from the same artist, with live albums, Greatest Hits collections, or remixes and so forth. One helpful way to make it a bit easier to track down actual duplicate versions of the same song is to use the song “Time” column to see how long each track is. If the tracks are the exact same length, it’s more likely the songs are actually the same and not just different recordings with the same name. Also be sure to pay attention to the Album name too, since that can be a helpful indicator. The best way to determine if found duplicates are actually duplicate songs is to display the duplicate files as instructed above, and then simply listen to the songs in iTunes. This applies even if you use the Option key trick to “Show Exact Duplicates” to remove, which is also not perfect. Also note that imported recorded Voice Memos from iPhone will appear in an iTunes library as a track, and if they are labeled simply as the default “New Voice Recording” they will appear as duplicates even if they are not. If you have found confirmed duplicates, you can always delete them directly from iTunes, or locate the iTunes music library files and make your adjustments in the file system instead. If you’re not using iTunes 12 for whatever reason, then you can still find duplicate items by using the guide here, which works for iTunes 11, iTunes 10, and earlier releases as well. 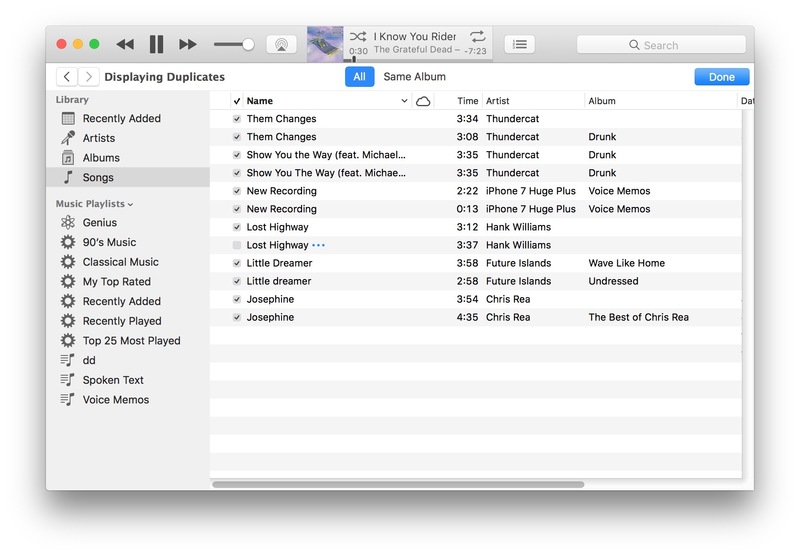 Do you have any other tips for tracking down duplicate songs and tracks in iTunes? Share them in the comments below!